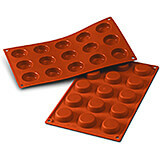 Our Silicone Baking Molds are made of a durable food grade silicone based that is laminated and rubberized. 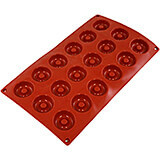 Professional Grade Silicone means that your cakes and desserts will not stick to the mold and get ruined. 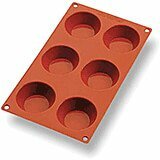 Our large selection of silicone bakeware comes in different shapes and sizes to help you create stunning cakes and desserts at home or your business. 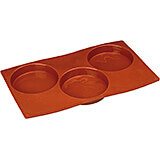 Made of extra strong pure food grade silicone, these baking molds provide even cooking results. High temperature resistance, quick and easy to handle with no greasing needed, they are easy to clean and dishwasher safe. 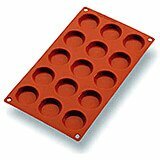 The circulation of warm air under these Aerated Silicone Molds ensure the right coloring along with a soft bake without browning the dough. 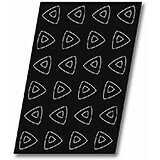 Full size (23.75" x 15.75") made of a durable food grade silicone based woven fabric that is laminated and rubberized. Suitable for baking a variety of sweet creations. Half size (15.75" x 12") made of a durable food grade silicone based woven fabric that is laminated and rubberized. 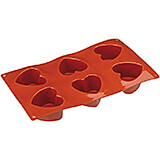 Suitable for baking a variety of sweet creations. 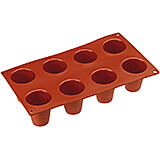 11.88" X 6.88" X 1.5"
These molds are made of non-stick food grade silicone and are temperature resistant from -40 degrees F. to 500 degrees F. Each multi mold sheet measures 11.87 long by 6.87 wide. They are reusable up to 3,000 times. 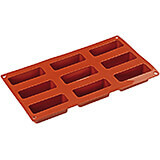 1.875" X 1.875" X 0.75"
These molds are made of non-stick food grade silicone and are temperature resistant from -40 degrees F. to 500 degrees F. Each multi mold sheet measures 11" long by 6" wide. They are reusable up to 3,000 times. 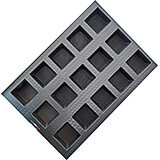 These molds are made of non-stick food grade silicone and are temperature resistant from -40 degrees F. to 500 degrees F. Each multi mold sheet measures 11.87 long by 6.87 wide. They are reusable up to 3,000 times. 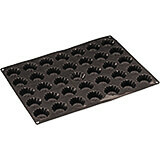 Features:Holds 24 eggsClear plastic coverComes with a black knowCommercial qualityMaterial: Silicone. 11.88" X 6.88" X 1"
These molds are made of non-stick food grade silicone and are temperature resistant from -40 degrees F. to 500 degrees F. Each multi mold sheet measures 11.87 long by 6.87 wide. They are reusable up to 3,000 times. 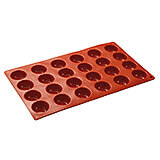 Features:Medium weightA staple for any pastry chefMultiple plastic coatingsProfessional qualityMaterial: Silicone. 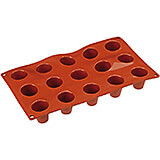 These molds are made of non-stick food grade silicone and are temperature resistant from -40 degrees F. to 500 degrees F. Each multi mold sheet measures 11.87 long by 6.87 wide. They are reusable up to 3,000 times. Features:PlasticCreates traditional looking bread loavesCreates a crusty outsideIdeal for use with heavy breadMaterial: Silicone. 11.88" X 6.88" X 2.38"
11.88" X 6.88" X 2"
Bavarois size: Diam. 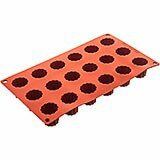 2 3/8" X H 2"These molds are made of non-stick food grade silicone and are temperature resistant from -40 degrees F. to 500 degrees F. Each multi mold sheet measures 11.87 long by 6.87 wide. They are reusable up to 3,000 times. Features:Medium weightA staple for any pastry chefMultiple plastic coatingsProfessional qualityMaterial: Silicone. 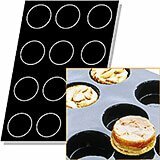 These molds are made of non-stick food grade silicone and are temperature resistant from -40 degrees F. to 500 degrees F. Each multi mold sheet measures 11.87 long by 6.87 wide. They are reusable up to 3,000 times. Features:Set of 10Great for making aspicIdeal for creating mousseGreat for layeringMaterial: Silicone. 11.88" X 6.88" X 1.12"
Canele size: Diam. 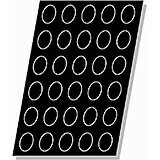 1 1/8" X H 1 1/8"These molds are made of non-stick food grade silicone and are temperature resistant from -40 degrees F. to 500 degrees F. Each multi mold sheet measures 11.87 long by 6.87 wide. They are reusable up to 3,000 times. Features:Sturdy constructionA staple for any pastry chefMultiple plastic coatingsProfessional qualityMaterial: Silicone. These molds are made of non-stick food grade silicone and are temperature resistant from -40 degrees F. to 500 degrees F. Each multi mold sheet measures 11.87 long by 6.87 wide. They are reusable up to 3,000 times. 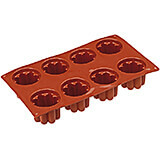 Features:Sturdy constructionA staple for any pastry chefMultiple plastic coatingsProfessional qualityMaterial: Silicone. 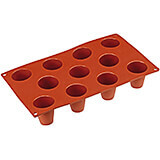 These molds are made of non-stick food grade silicone and are temperature resistant from -40 degrees F. to 500 degrees F. Each multi mold sheet measures 11.87 long by 6.87 wide. They are reusable up to 3,000 times. 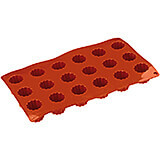 Features:PlasticA necessity for any bakerKeeps cakes freshClear so you can see contentsMaterial: Silicone. 11.88" X 6.88" X 1.38"
These molds are made of non-stick food grade silicone and are temperature resistant from -40 degrees F. to 500 degrees F. Each multi mold sheet measures 11.87 long by 6.87 wide. They are reusable up to 3,000 times. Features:Professional qualityA necessity for bakersCrisp and clean linesMakes imprints on doughMaterial: Silicone. Hemisphere size: Diam. 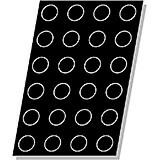 2 3/8" X H 1 1/8"These molds are made of non-stick food grade silicone and are temperature resistant from -40 degrees F. to 500 degrees F. Each multi mold sheet measures 11.87 long by 6.87 wide. They are reusable up to 3,000 times. 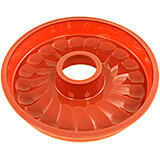 Features:Medium weightA staple for any pastry chefMultiple plastic coatingsProfessional qualityMaterial: Silicone. These molds are made of non-stick food grade silicone and are temperature resistant from -40 degrees F. to 500 degrees F. Each multi mold sheet measures 11.87 long by 6.87 wide. They are reusable up to 3,000 times. 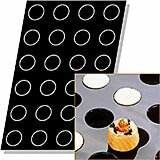 Features:Professional qualityA staple for any pastry chefIncludes a coupler and two coupler insertsGreat for decorating cakes and sweetsMaterial: Silicone. 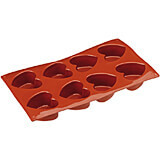 Madeleine size: L 2.5" X W 1.25" X H 0.5"These molds are made of non-stick food grade silicone and are temperature resistant from -40 degrees F. to 500 degrees F. Each multi mold sheet measures 11.87 long by 6.87 wide. They are reusable up to 3,000 times. Features:Sturdy constructionA staple for any pastry chefMultiple plastic coatingsProfessional qualityMaterial: Silicone. Madeleine size: L 1 5/8" X W 1 1/8" X H 0.5"These molds are made of non-stick food grade silicone and are temperature resistant from -40 degrees F. to 500 degrees F. Each multi mold sheet measures 11.87 long by 6.87 wide. They are reusable up to 3,000 times. 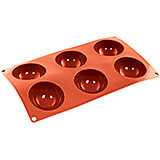 Features:Sturdy constructionA staple for any pastry chefMultiple plastic coatingsProfessional qualityMaterial: Silicone. These molds are made of non-stick food grade silicone and are temperature resistant from -40 degrees F. to 500 degrees F. Each multi mold sheet measures 11.87 long by 6.87 wide. They are reusable up to 3,000 times. 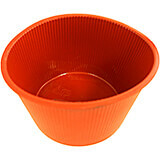 Features:Stainless-steelA necessity for any bakerProfessional qualityKeeps hands safeMaterial: Silicone. 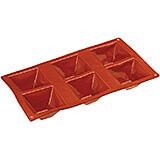 11.88" X 6.88" X 1.88"
These molds are made of non-stick food grade silicone and are temperature resistant from -40 degrees F. to 500 degrees F. Each multi mold sheet measures 11.87 long by 6.87 wide. They are reusable up to 3,000 times. 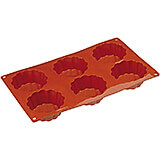 Features:PlasticA necessity for any bakerMakes decorating a snapSturdyMaterial: Silicone. These molds are made of non-stick food grade silicone and are temperature resistant from -40 degrees F. to 500 degrees F. Each multi mold sheet measures 11.87 long by 6.87 wide. They are reusable up to 3,000 times. 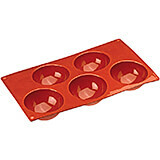 Features:AluminumA necessity for any pastry chefMakes decorating a snapSturdyMaterial: Silicone. 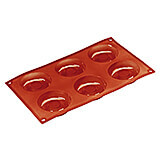 11.88" X 6.88" X 1.13"
These molds are made of non-stick food grade silicone and are temperature resistant from -40 degrees F. to 500 degrees F. Each multi mold sheet measures 11.87 long by 6.87 wide. They are reusable up to 3,000 times. 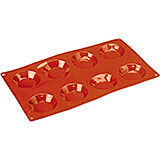 Features:11 7/8" round3/4" elevatedquickly coolsgreat for cookies, pastries, and breadsMaterial: Silicone. 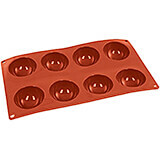 Non-stick Silicone Mold, Panettone Bread, 10"
Non-stick Silicone Mold, Quiche / Tart, 11"
Non-stick Silicone Mold, Quiche / Tart, 3"
Non-stick Silicone Mold, Quiche / Tart, 8.62"
8.62" X 8.62" X 1.5"
Cup size: L 3 1/8" X W 1 1/8" X H 1 1/8These molds are made of non-stick food grade silicone and are temperature resistant from -40 degrees F. to 500 degrees F. Each multi mold sheet measures 11.87 long by 6.87 wide. They are reusable up to 3,000 times. Features:Stainless-steelExtremely usefulProfessional qualityA great solutionMaterial: Silicone. 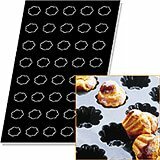 Non-stick Silicone Mold, Savarin Shape, 9.5"
9.5" X 9.5" X 2.38"
Nonstick sheet features: No greasing, releases and cleans easily. Withstands temperatures from -40°F to + 580°F. Made of extra strong, laminated, rubberized, food grade silicone based woven fabric. Reusable between 2,000-3,000 times. Sheet of 12. Sheet size: 15 3/4" x 12". Mold size: 1 3/8" Diam. 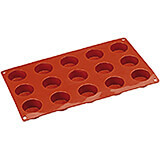 x 1 1/2" H. Capacity: 3 oz. Weight: 10 oz. 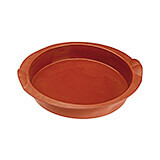 Nonstick sheet features: No greasing, releases and cleans easily. Withstands temperatures from -40°F to + 580°F. Made of extra strong, laminated, rubberized, food grade silicone based woven fabric. Reusable between 2,000-3,000 times. Sheet of 24. Sheet size: 15 3/4" x 12". Mold size: 1 9/16" Diam. x 3/4" H. Capacity: 9 oz. Weight: 7/8 oz.